In time honoured fashion the final lecture was delivered by Dr Alan Chapman. His subject this year was Edmond Halley, and as we soon learned Halley was not just an exceptional astronomer, his experiments, observations and research extended into many varied fields of science and professions, including fledgling scientific concepts and ideas. Halley was born in Shoreditch on the 8th November 1656. His father, Edmond Halley Sr. came from a Derbyshire family and was a wealthy soap-maker in London. Apart from the soap business, the Halley’s had plenty of properties in London. Even though, they lost some of their assets during the 'Great Fire of London' in 1666, it hardly affected their financial status; as Alan stated; ‘they were quite well off’. As a child Halley was very interested in mathematics and received private tuitions at home till he was admitted to St. Pauls School where he excelled in everything he did and became the captain of the school at the age of just 15. His father had already kitted out Edmond with all the necessary astronomical equipment required and in 1673 Halley went to Queens College;Oxford and whilst an undergraduate, he published papers on the Solar System and sunspots. However, he left the college in 1675 without completing his degree and started working for John Flamsteed who was the ‘Astronomer Royal’ at the Greenwich Observatory. Among other things, Halley had the job of assigning what is now called Flamsteed numbers to stars. ‘Halley was starting to make a name for himself’. With the financial backing of his father, support from King George II and the East India Company providing the means, in 1676 Halley set out for St. Helena Island in the southern Atlantic, not a perfect location for celestial observations. Nevertheless, Halley spent a year and a half there setting up an observatory, cataloguing 341 southern hemisphere stars, discovering a star cluster and recording observations on the transit of Mercury. This got Halley wondering whether a similar transit of Venus could be used to determine the absolute size of the Solar System. He also noted and recorded inaccuracies of the pendulum time pieces when at different altitudes and wondered if this was due to the influence of mass and the effect of gravity because of the mountain. He returned to England in May 1678, and published the results of his observations on St. Helena as Catalogus Stellarum Australium These additions to contemporary star maps were well received, with Flamsteed describing Halley as the "the southern Tycho” comparing him favourably with Tycho Brahe who’s maps of the northern hemisphere were considered the standard. The star of Halley continued to rise. Halley was then asked by The Royal Society to help resolve a dispute between astronomer Johannes Hevelius and Robert Hook. 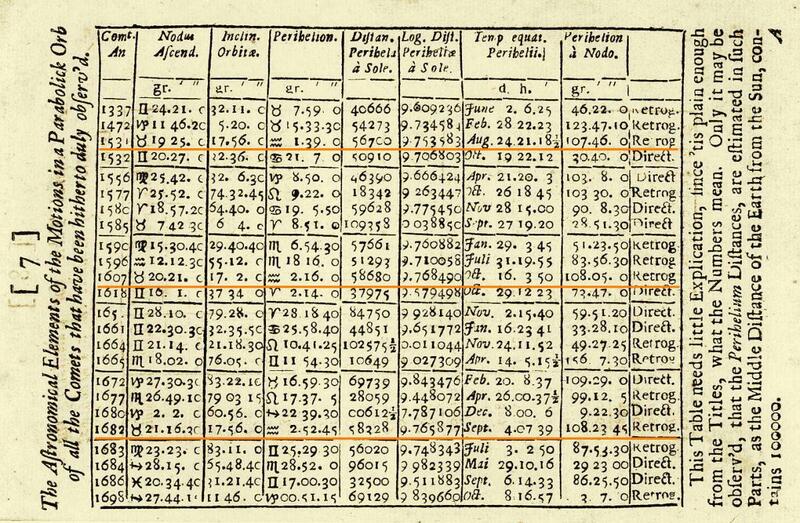 Halley stayed with Hevelius at Danzig, and verified the quality of Hevelius' observations. Halley was awarded his M.A. degree at Oxford more or less by royal decree and elected as a Fellow of the Royal Society at the age of just 22. He then embarked on a grand scientific tour of Europe, which was probably easier then than it is now – as long as you had a good grasp of Latin, which Halley naturally had. He returned triumphant, but all the adulation heaped on Halley started to knar on John Flamsteed whose earlier liking for the student turned into enmity. Halley spent a great deal of time on lunar observations, but was also interested in the problems of gravity. One problem that attracted his attention was the proof of Kepler's laws of planetary motion. In 1684, Halley, with fellow Royal Society members Christopher Wren and Robert Hooke, visited Isaac Newton to discuss theories of planetary motion. Newton showed them his calculations. Halley persuaded Newton to expand his studies and allow him to edit the work. Halley paid all the expenses, corrected the proofs himself, and brought "Philosophiae Naturalis Principia Mathematica" ("Mathematical Principles of Natural Philosophy," often referred to as the "Principia") to print in 1687. Years later, Halley’s fruitful association with Newton paid off as Newton was offered the position of the Master of Mint and he appointed Halley as the deputy controller of the mint at Chester. A year later Halley put forth the idea of a hollow Earth, consisting of a shell about 500 miles (800 km) thick, two inner concentric shells and an innermost core. He suggested that atmospheres separated these shells, and that each shell had its own magnetic poles, with each sphere rotating at a different speed. Halley proposed this scheme to explain anomalous compass readings. In 1694 Halley then suggested that the story of Noah's flood might be an account of a cometary impact, this was a little too preposterous for the liking of The Royal Society who censured Halley. Nevertheless Halley continued to work for the Royal Society in a number of endeavours. He edited "Philosophical Transactions," published some of the world's first actuarial tables, and published a map of the world that showed the prevailing winds over the oceans; the first meteorological chart. In 1698, Halley was given command of the Paramour, a 52 feet (16 m) pink (a small sailing vessel) so that he could carry out investigations in the South Atlantic into the laws governing the variation of the compass. On 19 August 1698, he took command of the ship and, in November 1698, sailed on what was the first purely scientific voyage by an English naval vessel. Unfortunately problems of insubordination arose over questions of Halley's competence to command a vessel. Halley returned the ship to England to proceed against officers in July 1699. The result was a mild rebuke for his men, and dissatisfaction for Halley, who felt the court, had been too lenient. 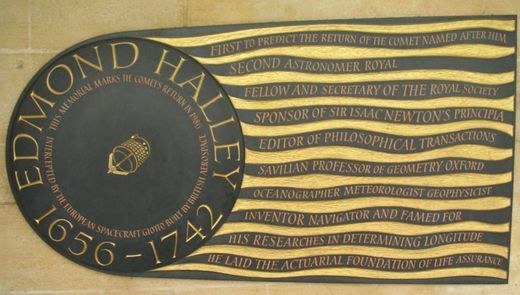 Halley thereafter received a temporary commission as a Captain in the Royal Navy, recommissioned the Paramour in August 1699 and sailed again in September to make extensive observations on the conditions of terrestrial magnetism. This second Atlantic voyage lasted until 6 September 1700, and extended from 52 degrees north to 52 degrees south. Halley even spotted icebergs. The results were published in General Chart of the Variation of the Compass (1701), yet another first. In November 1703, Halley was finally appointed Savilian Professor of Geometry at the University of Oxford and in 1705, applying historical astronomy methods, he published Synopsis Astronomia Cometicae, which stated his belief that the comet sightings of 1456, 1531, 1607, and 1682 related to the same comet, which he predicted would return in 1758. Halley did not live to witness the comet's return, but when it did, the comet became generally known as Halley's Comet. 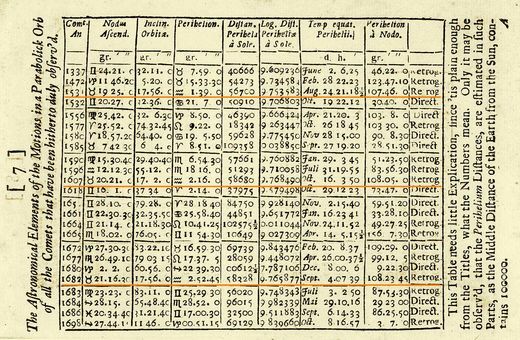 Halley's table predicting the return of comets, including "Halley's Comet"
By 1706 Halley had learned Arabic and completed the translation of numerous important Arabic and then original Greek volumes into a complete Latin edition by 1710. 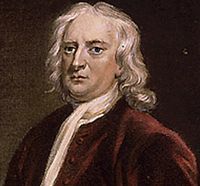 In 1716, Halley suggested a high-precision measurement of the distance between the Earth and the Sun by timing the transit of Venus across the Sun from different locations on the Earth’s surface (but that is another topic we should all know quite well) In 1718 he discovered the proper motion of the "fixed" stars by comparing his astrometric measurements with those given in Ptolemy's Almagest. Arcturus, Aldebaran and Sirius were noted to have moved significantly, the former having progressed 30 arc minutes (equivalent to the diameter of the moon) southwards in 1800 years. In 1720, together with his friend the antiquarian William Stukeley, Halley participated in the first attempt to scientifically date Stonehenge. They were wrong by thousands of years, but the idea that scientific methods could be used to date ancient monuments was revolutionary in its day. Halley succeeded John Flamsteed in 1720 as Astronomer Royal, much to the anger of Flamsteed’s widow who sold all the instruments which belonged to her husband so that Halley couldn’t use them. Halley held this position until his death in 1742 at the age of 85. Always partial to a good bottle of wine, one evening Halley settled in his favourite chair, drained his glass and passed away peacefully in his sleep. Halley was buried in the graveyard of the old church of St. Margaret, at Lee, South London. Often remembered solely for his association with the comet which bears his name (most people think it was he who discovered the comet) Halley was far more than just an astronomer, he was a radical thinker, a diplomat, mariner, a pioneer of scientific concepts, inventions and ideas in fields of Geophysics, mathematics, meteorology and Physics. Without doubt Halley has to be ranked as one of Britain’s greatest minds!